Fruitless Pursuits: Most Memorable Presents: Bustin' Makes Me Feel Good. Most Memorable Presents: Bustin' Makes Me Feel Good. And yes! That is the Ghostbusters soundtrack on classic cassette! A luxury convenience in a world where, if you wanted to hear a specific song, you would have to listen to the radio all day and hope for the best. In fact, I wouldn't be surprised if this was the first cassette I owned. Back then, the whole planet was gripped by Ghostbusters fever, and maybe it was the fact that they had not made any toys at this stage that made the few available items of merchandise so desirable. 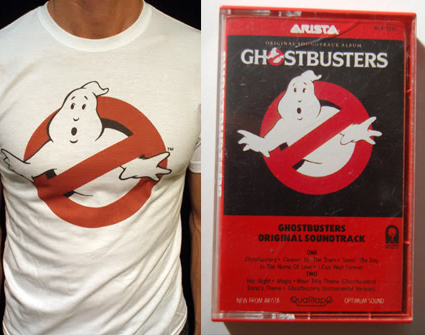 Owning a Ghostbusters logo T-shirt was a rite of passage in 1984 and it would be hard-pressed to find any teenager or child alive at that time that didn't have one. It was just like how every single person in the world was required to own a Batman symbol T-shirt in 1989. At tender age of eight Ghostbusters still kind of scared the crap out of me, but rest assured I still wore that shirt with pride. It was one of my four favourite childhood items of clothing, alongside a silver vinyl jacket, a white sweatshirt with Garfield on it, and a black sweatshirt covered in puffy neon space invaders. The eighties were a stylish time.